The shomin-geki, a particular type of Japanese family drama, is a long-established genre dating back to the early 1920s, but it is one which is perenially associated with, indeed practically synonymous with, the director Ozu Yasujiro, whose work is currently the subject of a major retrospective at the BFI. 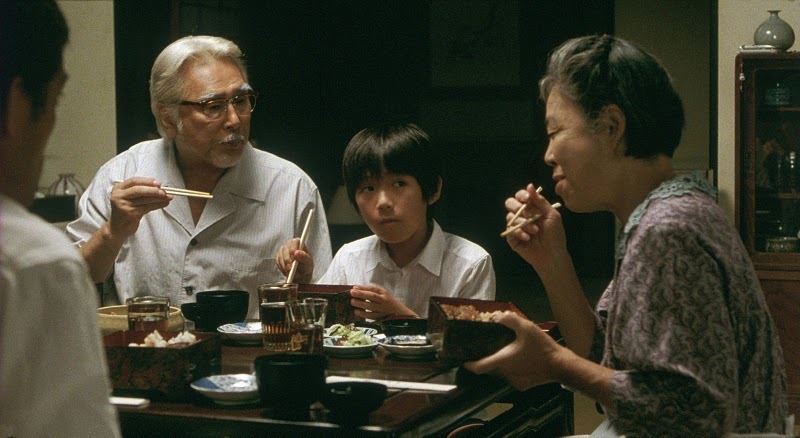 There is perhaps no better context within which to view this film by Koreeda Hirokazu, a director who has long been spoken of as his natural heir, given that his films share similar themes and concerns with those of his predecessor. Still Walking sees the parallels between them stronger than ever, and if one were to imagine the ghost of the great director watching with us, he would surely be nodding in silent approval. A prologue introduces us to Kyohei and his wife Toshiko, an elderly middle-class couple living in a quiet coastal town. We see the old man doggedly struggle up some steps before exchanging kind greetings with a lady, from which exchange we learn that he is the area’s retired former doctor, and later that his house is his former surgery, still full of now disused medical paraphernalia. In contrast to this character, we are then swiftly introduced to his son Ryota who is travelling by bus with his new wife and stepson to visit his parents. In these early exchanges he seems uncaring towards his father and mother, expressing his wish to stay with them for as little time possible; in the meantime his own concerns have blinded him to the nervousness of his new bride at the prospect of meeting her in-laws for the first time. Such a setup inevitably recalls Tokyo Story (1953), and the expectation is that the story will be about an uncaring son who is woefully neglecting his kindly parents, yet as soon as he arrives this is turned on its head. In truth, it is the father who is the transgressor, and greets his son with cold inhospitability; he holds lingering resentment that Ryota decided not to follow in the family tradition and become a doctor, and shows disdain for his chosen career as an art restorer. Toshiko is little kinder to her son, and confesses to daughter Chinami her disdain for his marrying a widow: after all, at least a divorcee might have chosen to leave her husband. Where Koreeda’s script and direction excel, though, is in how skilfully he manages to weave the tangled web of characters and their inter-relationships so that frequently within the same frame we can see a whole variety of emotions being experienced simultaneously by different characters, usually along generational lines. As well as dramatically underlining the gap between their attitudes, it also lends a huge sense of authenticity to this familial portrait: after all, how many family gatherings see all participants synchronised emotionally? More often the blinkers are on for the duration. The shooting style – mostly carefully composed medium shots – might suggest observational distance rather than emotional intimacy, and yet film proves to be a bridge between the two; like Ozu’s films we feel like another visiting guest in the household, and when narrative resolution is achieved and the film closes there is a sense of emptiness in having to leave the world we have been living in for the previous two hours. The other director whose work springs to mind as a comparison piece is the late, great Edward Yang, another master of deep, subtle humanism. Koreeda’s beautiful, delicate film deserves such illustrious company.